A relatively large butterfly with wingspan about 8-9cm that is quite a frequent visitor to our front yard garden. It is to be found hovering around foliage and flowering bushes, quite happy to remain still for sometime but take a quick flight whenever I approach too close for a shot. This Lime Butterfly or Lime Swallowtail as commonly named, is also seen frequenting our potted Murraya koenigii (Curry Leaves) at our backyard, as well as outside our backyard fencing where plants and bushes are simply strewn haphazardly by our back neighbour. It does look untidy at his end, but I’m delighted all the same as butterflies, insects and birds come visiting. :D Amongst the greenery, I did notice a Lime (Citrus) bush which probably is its main attraction, being its primary host plant, hence the name Lime Butterfly. Chequered Swallowtail is another of its common name due to the beautiful and colorful chequered patterns on its wings, though it does not have a prominent tail as in most swallowtail butterflies. The upperside of its wings is predominantly black with lovely whitish-yellow spots of irregular sizes and a distinct deep orangy-red oval spot at its hindwings. Its underside is mainly yellow with black markings and more colorful as seen in the right image posted here. 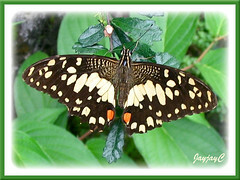 The Lime Butterfly (Papilio demoleus malayanus) is often mistaken with the Citrus Butterfly (Papilio demodocus) as they look very similar. There are a couple of small differences though, and the best way to differentiate them is to observe the orange dots on the hind wings. If the orange spot has a black dot inside that fills most of it, then it is a Citrus Butterfly, whereas if the black dot is smallish and only found on top of it, then it is a Lime Butterfly. Whatever, both these butterfly species are recognized as major pests of citrus in agricultural cultivation. Range: Worldwide in distribution. Oman, UAE, Saudi Arabia, Kuwait, Bahrain, Qatar, Iran, western and possibly eastern Afghanistan and western Pakistan. Sri Lanka, India and Nepal. Andamans. Burma, Thailand, the Philippines, Kampuchea, southern China (including Hainan, Guangdong province), Taiwan, Japan (rare strays), Malaysia, Singapore, Indonesia (Kalimantan, Sumatra, Sula, Talaud, Flores, Alor and Sumba), Papua New Guinea, Australia (including Lord Howe’s island), apparently Hawaii and possibly other Pacific Ocean islands. 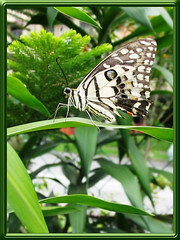 Formerly absent from Borneo it is now one of the commonest Papilionids in Sabah and Sarawak in Malaysian Borneo, Kalimantan (Indonesian Borneo) and in Brunei. In the Western Hemisphere, Dominican Republic, Jamaica, and Puerto Rico. Habitat: Diverse habitats. Urban areas that include gardens and parks, as well as rural areas and countrysides near human settlements. It is to be found too at open plains, scrublands, savannahs and even on wooded regions, hills, stream and riverbeds. Food plants: The larval food plants are mostly plants in the Rutaceae family, especially Citrus species and Murraya koenigii. 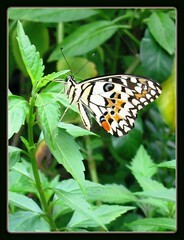 Wherever there is a Lime or Lemon bush, you’re bound to see this butterfly species nearby. The adults on the other hand, can be found feeding on a variety of flowers, preferring flowering legumes (Fabaceae family) if available. 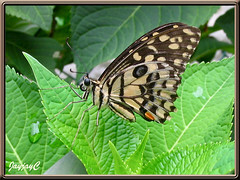 Life history: Do explore Kwan’s Plant Observatory to enjoy a complete life history of the Lime Butterfly (Papilio demoleus malayanus) that included a fantastic pictorial view too. After mating, the female Lime butterfly lays here eggs singly on the topside of the host leaves, especially of the Citrus plant. Eggs hatch into immature larvae in about six days or more, resembling bird’s droppings, and develop into mature larvae (10-15mm long), green in color. They can then grow up to 45mm to become caterpillars, feeding on the host leaves until they form their pupae. The chrysalides are usually found hanging upright, supported with a silken girdle onto the host plant until they emerge as young adults. Other links: Check Wikipedia for added information and more images at http://yutaka.it-n.jp/pap/10250010.html. Sorry, I am unable to identify your butterfly. You may want to try at these 3 websites, namely Chin’s Butterfly Gallery, Butterflies of Singapore and Butterflies of Sri Lanka which I normally frequent to help identify butterflies found in our garden. Wish you success in your name search.